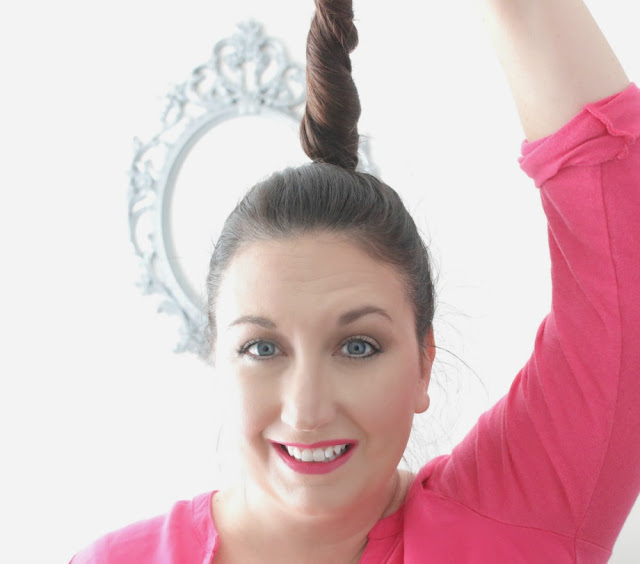 Ready for a spring hairstyle that requires no heat, no bobby pins, and is super easy to do? Enter the top knot, and it's one of the hottest hairstyles right now--just search "celebrity top knot" and you'll see what I mean. It's not as structured as a ballerina bun but more structured than a messy bun. And it only requires a brush and hair elastics. 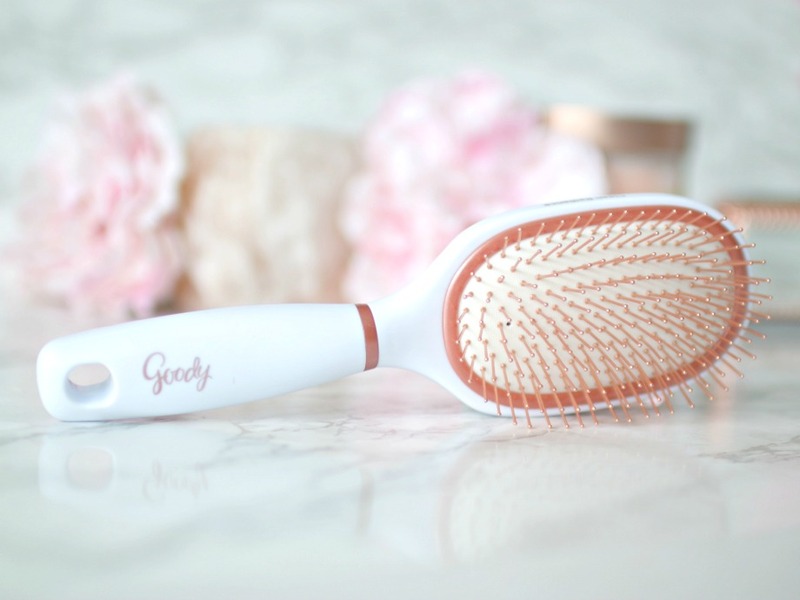 I went to Target and picked up the Goody Clean Radiance Oval Cushion Brush and the Goody Ouchless Elastics. I picked the Goody Clean Radiance Oval Cushion Brush because the copper bristles massage the scalp to help reduce buildup, which means hair will will healthier and more radiant. Plus, it's adorable. I even painted my nails to match it. What? Just make sure you don't use it with a blow dryer since the copper bristles will get hot. To clean it, just dip in lemon juice and wipe away! 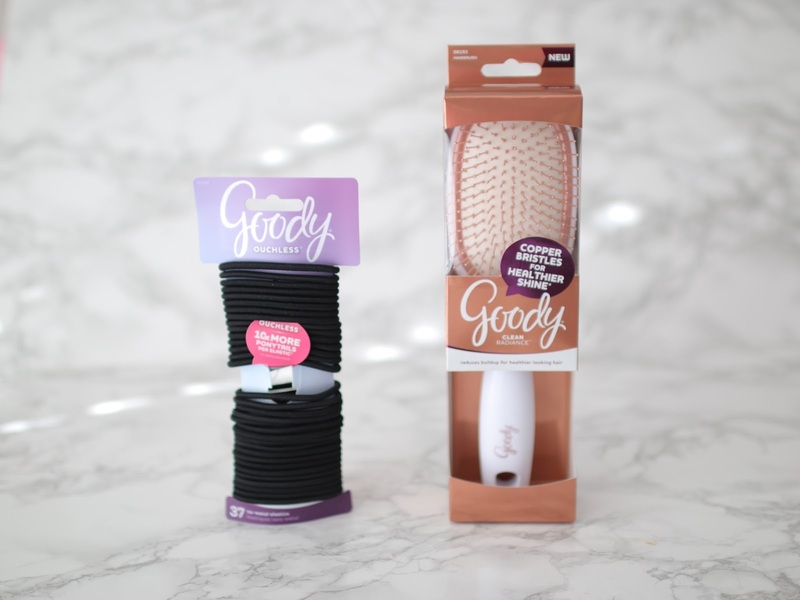 The Goody Ouchless Elastics are a must for me, since they give a comfortable, secure hold. I chose black but they have neutrals and colors. And you get 10x more ponytails than the leading competitors. 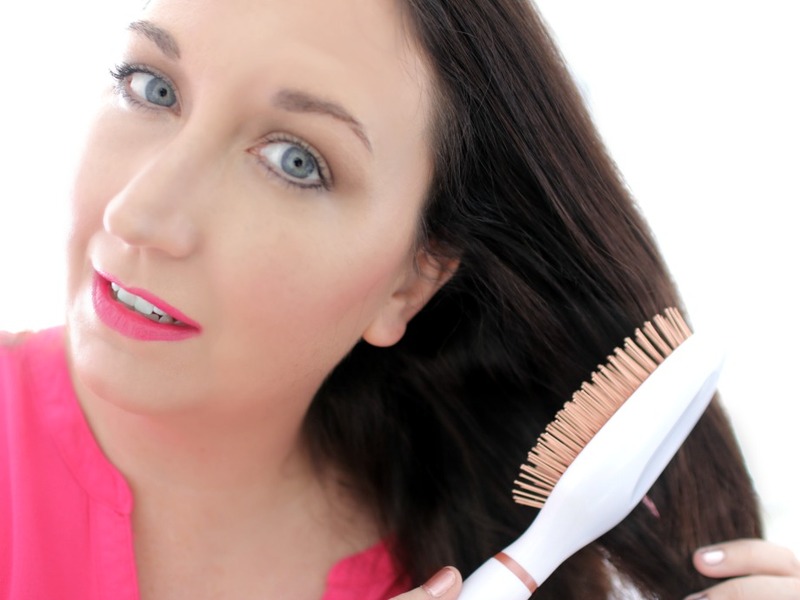 Brush dry hair to remove tangles. This hairstyle can be done on freshly-washed hair or needs-to-be-washed (me). 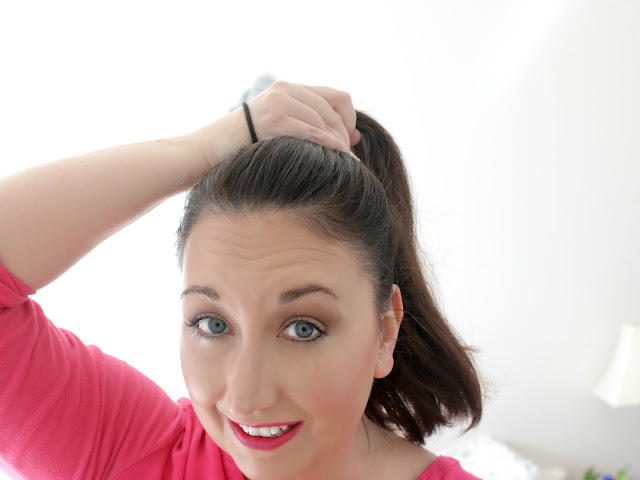 Pull hair into a high pony on top of head. Make sure it's centered. Now twist the tail. It doesn't matter the direction of the twist. Bend the twist into a horseshoe or donut and secure with elastic at the base. There should be a bit of tail sticking out. Note how it's not flat against the head like a bun--this is a "knot." Take the tail that remains and divide in half. Wrap it around base of knot. If you have thin hair you can simply tuck it under the elastic, or you can use another elastic (that's what I did) to secure it. Bits of it should stick out. TIP: If your hair is shorter than mine, try a mini top knot. Just pull back the top layer and do the steps mentioned above. Would you try a top knot? 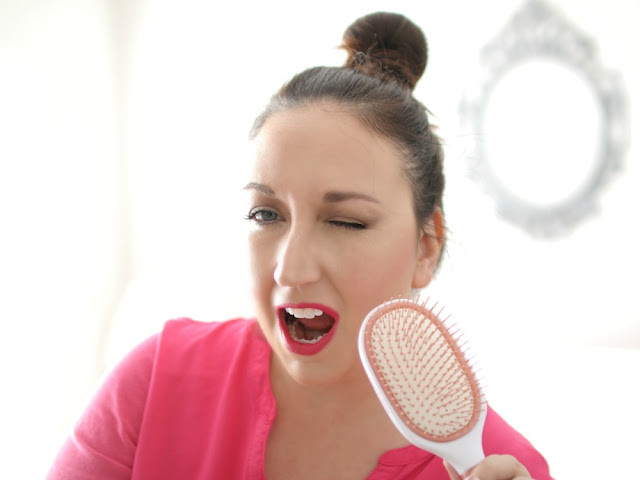 Fess up: do you use your hair brush as a microphone? I was a ballerina too, and top knots would never have been allowed. This is different because it pokes up and is not flat against the head. So cute! Buns are one of my favorite hairstyles to rock on busy days! Love the Bun Elle! I love using those Goody Ouchless Elastic Band for my hair! Goody hairbands are the only way to go. They hold my hair so good. Super cute, Elle! My hair seems to be too thin and not long enough, so when I try the top knot it turns into this very tiny bun lol!!! I love a good top knot and you make it look so easy to do. I have the hardest time doing it. For the life of me, I can't do a topknot bun. I'm gonna try your tricks and see if I can do it. Thanks for sharing. That's my favorite way to do a bun! I love your topknot and I love that your nails match the brush :) I've tried to do a hairstyle like this but I rarely have luck--even when I don't make it too tight my head ends up hurting after a while. I guess I'm just not used to having my hair pulled back! 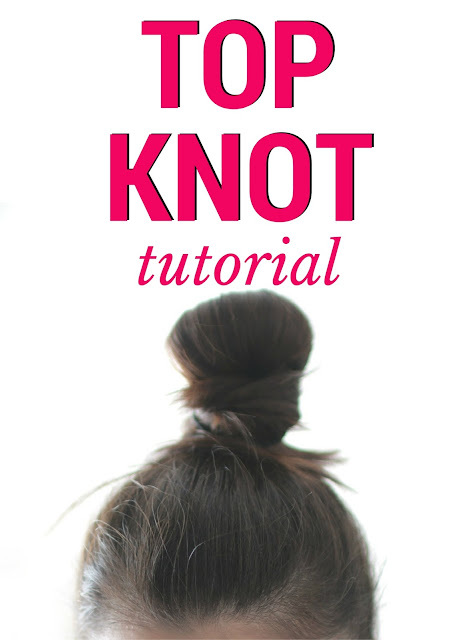 You have perfected the top-knot and this sounds like an easy tutorial. Also, such fresh makeup for Spring. Thanks for sharing this - I needed it. I will be back tomorrow and more this week to catch up. I know I have been MIA but I have been so busy. Have a great Monday! I do this all the time but as a low knot! I never had any idea what to do with the tail sticking out so thank you for the tips, Elle! I need to try this... because, trust me... most morning I just don't have time to do much with my hair! Thanks for another great tutorial! 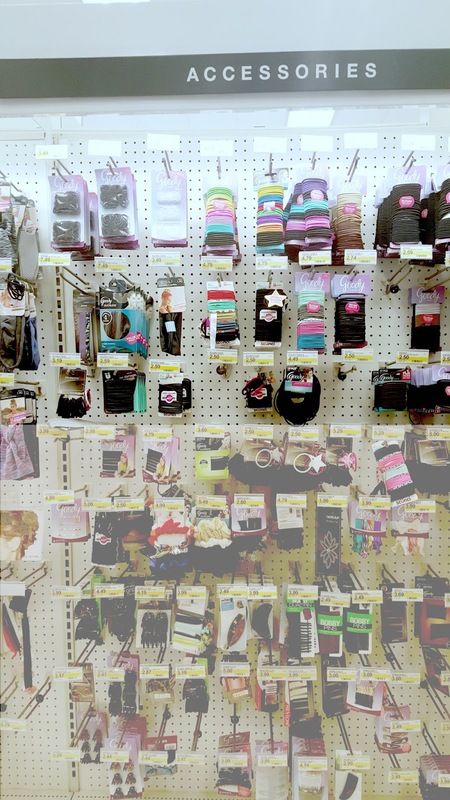 I love the Goody hair ties because they don't pull on my hair! My go-to lazy day hairstyle! I love doing a top knot because it doesn't leave "hair dent" when you take it out like ponytails do. I used to love top knots before I cut my hair. They require minimal effort and are super chic. Thinking of you today sweet friend! I haven't tried a bun like this before. I have tried something similar but not exact. I'll have to give this a try! I usually rock a top know when I'm at home, I haven't actually left the house with one...might have to ones of these days! Looks so cute on you! So cute! I can never get my top knot to look good so I needed this! You rock it! I need a new brush and that one sounds awesome! Thanks for the great tutorial! Love wearing my hair in a top knot. So going to have to try your Bobbie pin free one out soon. 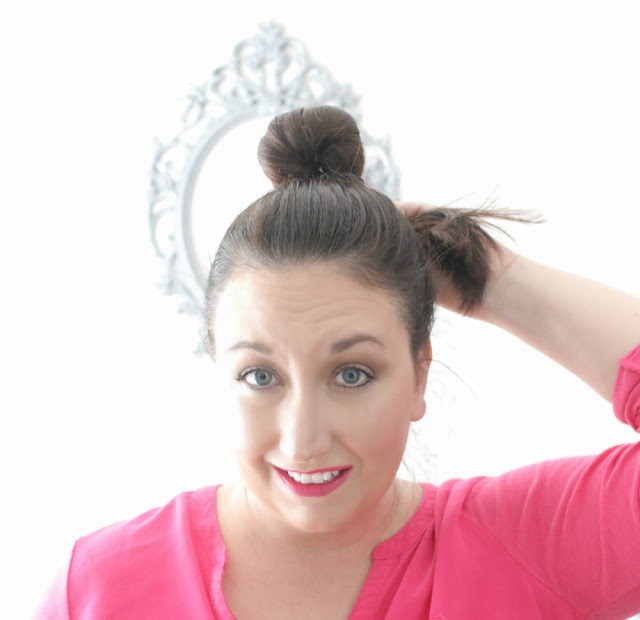 Love this top knot on you! Love this! I need longer hair so I can rock a top knot again! Nice, I need help with my hair. I basically just throw it into a ponytail. Cartwheel is seriously the best thing ever!! 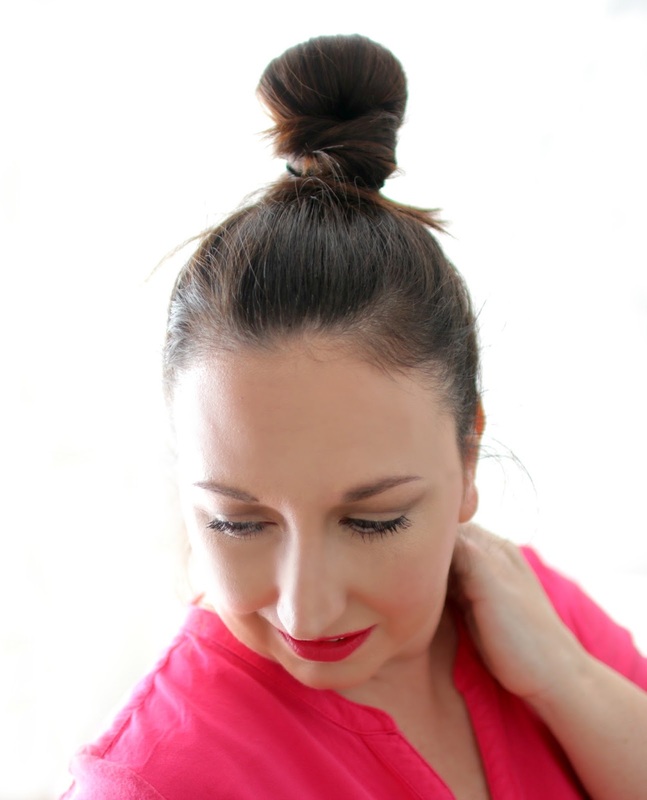 Love your top knot! I don't have enough hair to do this with now lol. I have been looking for a new brush. this may be the one. This is a great warm weather hairstyle! I'm going to try the mini version. Super cute! I love it. I LOVE a good top knot. And you look gorgeous, as always! I love the Cartwheel app! Great tutorial and it looks lovely in you! There's nothing better than a top knot! love your tutorial! Love this tutorial. 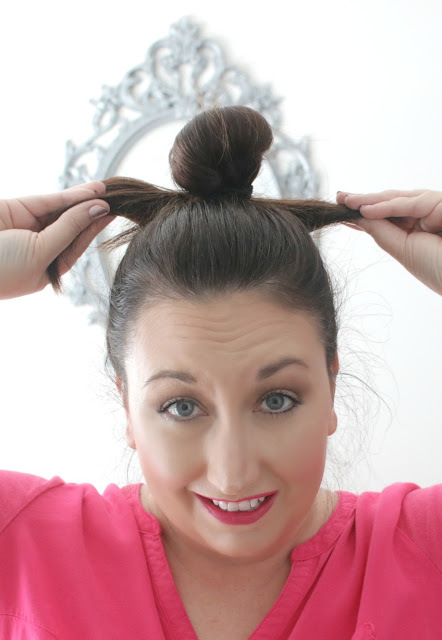 The top knot is super popular right now and Im glad to learn more tips about it! Cute topknot! It's SO perfect! And wow, I never thought to do it like that. I'll have to give it a try! Cute topknot! It's my go to for work and lazy days. i saw someone on tv last night with a cute mini knot on their head and i wanted to try it anyways. this is just more motivation. thanks girl! Your hair is so cute! I love this effortless style! I need to try the mini top knot! Nice tutorial. I love top knots for hot summer. always a classic do...! love that color lippie on you! !